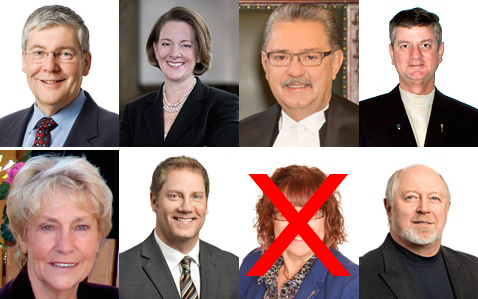 Dave Hancock, Alison Redford, Gene Zwozdesky, George VanderBurg, Bridget Pastoor, Rick Fraser, Linda Johnson (removed from list after she announced she is endorsing Jim Prentice – see update below), and Ron Casey. By my count, there remain eight seven Progressive Conservative MLAs who have not endorsed a leadership candidate Jim Prentice in the race to become that party’s next leader. As of this week, 49 50 of 59 PC MLAs have endorsed Mr. Prentice’s candidacy to become their next leader. Leadership candidates Ric McIver and Thomas Lukaszuk have not earned any endorsements from their MLA colleagues. Premier Dave Hancock, who is serving as the PC Party’s interim leader, has said he will not endorse any candidate as a condition of his temporary position in the Premier’s Office. Former Premier Alison Redford, whose scandal-filled departure triggered the leadership race, is not expected to endorse a candidate (it is unlikely that any of the leadership candidates would accept her endorsement). Ms. Redford remains the MLA for Calgary-Elbow. Assembly Speaker Gene Zwozdesky and PC Caucus Whip George VanderBurg are expected to stay neutral in the contest because of their positions in the Assembly. Although these are legitimate reasons, it is not a requirement. Former Speaker Ken Kowalski set a precedent by endorsing candidates in the 2006 and 2011 PC leadership races. Banff-Cochrane MLA Ron Casey was one of two MLAs to endorse Ken Hughes‘ short-lived leadership campaign and has remained quiet since he dropped out of the contest on May 12, 2014. The remaining three Tories who have yet to issue an endorsement are Lethbridge-East MLA Bridget Pastoor, Calgary-Glenmore MLA Linda Johnson (see update below) and Calgary-South East MLA Rick Fraser. It is suspected that Mr. Fraser’s decision to not join his colleagues in endorsing the front-runner is a reflection of the support Mr. McIver has in south east Calgary. It is expected that Mr. McIver’s campaign has sold a significant amount of PC memberships in south east Calgary’s sprawling suburbs, the area he represented on City Council and dominated in the 2010 Mayoral election. Coincidentally, the previous MLA for Mr. Fraser’s south east Calgary riding, Art Johnston, was the only candidate to endorse Ms. Redford in the PC Party’s 2011 leadership race. Update: MLA Ms. Johnson has endorsed Mr. Prentice’s candidacy, raising his total MLA endorsements to 50 out of 59 PC MLAs. This entry was posted in Alberta Politics and tagged 2014 Alberta Progressive Conservative leadership race, Alison Redford, Art Johnston, Banff-Cochrane, Bridget Pastoor, Calgary-Elbow, Calgary-Glenmore, Calgary-South East, Dave Hancock, Gene Zwozdesky, George VanderBurg, Jim Prentice, Ken Hughes, Ken Kowalski, Lethbridge-East, Linda Johnson, MLA Endorsements, Ric McIver, Rick Fraser, Ron Casey, South East Calgary Suburbs on July 17, 2014 by Dave Cournoyer. Hello – I would like clarify that I am supporting Jim Prentice. On June 13 after my constituency association AGM I advised my board of this position. Thanks for the comment, Linda. I have added an update to the post referring to your endorsement. Yawn. A third election and third different PC Premier. Prentice’s kiss of death is his support from this group of MLA’s who stood behind Stelmach before kicked him out and stood behind Redford before kicking her out. Forty years and what do we have to show for it? The PC’s are bad managers. The only quesiton is will Alberta voters kick them out out before they kick out Jim Prentice? I dont care who they elect to run , im not voting for them in any case. 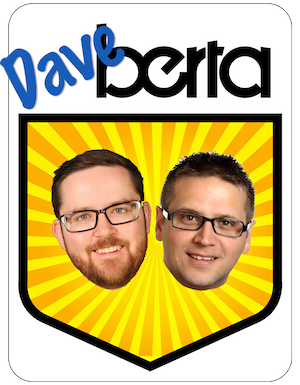 All you yawners, and lack lusters …… do you actually live in Alberta? This province leads most of North America in its abilities, economy, smarts. And have you heard, it does not have a sale tax at the counter? Oh, yes, the Progressive Conservative Party has been around to make it all happen. Lauraine…stop drinking the Tory KoolAid. AB has a $300Billion GDP(wikipedia) with a $40billion operating budget. While we pay flat provincial tax and no sales tax, we have a ballooning infrastrucuture deficit I. The hundreds of billions, no meaningful long term savings, instead we got a retarded deceitful balance sheet sold to us that even a 1st year accounting student would call flawed and deceptive. I get it…hospitals, schools and roads should be built on a squeaky wheel/complaint/people suffering basis/ and delivered to key ridings only to secure electoral success before and election. Have not provinces have an excuse to be this way, they are blessed with rich resources. We are blessed and still we are delivering balance sheets like ‘have not’ provinces along. If you think we this is normal and we have even slighly maximized our potential, may God help you. Just remember this is a $300billion economy. Healthcare and Education are around $26 billion, around 8.6% of GDP. There is no excuse for such a sloppy balance sheet. Ron Casey’s lack of Prentice commitment is certainly interesting, and I would say principled. He supported Hughes for good reasons. I think it’s a principled decision. Not jumping on this juggernaut takes some courage and principle. Considering there is very little in the way of policy or direction to justify support, you’d think more MLAs would be in the undecided column. It kinda smells more like “save my job” than support based on vision and ideas. Zwozdesky and VanderBurg, while not under obligation to avoid endorsing a candidate, are following the conventions of responsible government. To cite Kowalski as a precedent for choosing sides is to refer to the exception that proves the rule — examine his rulings as speaker, and you will see he is a poor example indeed. It’s official. As far as Ms Corbella is concerned Jim Prentice is the answer to our prayers—the leader for those of us who “pine for the days of Peter Lougheed and all that he embodied”. This statement is so fatuous that Ms Soapbox is compelled to respond with her own Top Ten List: Reasons Why Jim Prentice is Nothing like Peter Lougheed. Unlike David Letterman’s lists, this list is funny only if you ignore where we’ll end up if Jim Prentice and the PCs are re-elected in 2016. 8. Lougheed believed that Alberta’s natural resources belong to the people and wanted to see an increase in oilsands royalties. Prentice acts like our natural resources belong to the oil companies and refuses to increase royalties under any circumstances. 7. Lougheed wanted an increase in personal and corporate taxes in order to balance our strong economic performance with our weaker social and environmental performance. Prentice’s response? Read my lips, no new taxes. 6. Lougheed worried that the Alberta government let oilsands development get ahead of infrastructure and was paying the price in crumbling highways and crowded schools and hospitals. Prentice says damn the torpedoes, full steam ahead because there might be a “price correction” (read: oil price drop) as early as 2017 that will hit the oil producers right in the balance sheet. 4. Lougheed said “no” to Keystone XL and “yes” to value-added upgrading in Alberta. Prentice said the exact opposite. 3. Lougheed was a fiscal conservative who believed that government had a role in encouraging industry to act for the greater good of all Albertans. He believed that natural resources should be managed with good public policy and created the Alberta Energy Company and Alberta’s petrochemical industry as vehicles for job creation and economic growth. What is Prentice’s view on the government’s role vis-a-vis industry? Let me guess…If Big Oil is happy the rest will take care of itself. 2. Lougheed was a visionary leader with an eye to the future. He inspired Albertans who suffered through drought, depression and war to move into the mainstream of Confederation. ****Prentice is yesterday’s man. He personifies the status quo—a stagnant 43 year old government responding to the demands of Big Oil with no inkling of how to address the challenges of the 21st century. 1. In 2006 Peter Lougheed was asked what challenges would face the next premier of Alberta. He said would be many, but “on the economic side it will be trying to manage the development of the Alberta oilsands”. *****Prentice will turn management of the oilsands over to Big Oil because that’s what kindred spirits do. Anyone who suggests that Jim Prentice can govern Alberta with Peter Lougheed’s “legendary thoughtfulness, tone and command” demonstrates an appalling lack of understanding of all that Premier Lougheed achieved in the 14 years he governed this province. They ought to be ashamed of themselves.